Often the cover of a magazine catches my eye and I peruse through pages, and decipher just within a few seconds whether or not I want to know more about its contents. There's also a moment when I'm on a call and the decision to press hold comes when another call is intercepted ... unaware of the details! That's exactly what happened when a friend of mine phoned me to view the work of emerging talent and designer Sean McGirr. After taking a brief look at McGirr’s pieces an expressive and wearable tale was utterly apparent. But, this time it was quite singular to your typical men’s apparel. The intrigue and preface was made in a glance, chapter skipping was unnecessary and I had to find out more. So, I spoke to the source himself to fill in the pages. 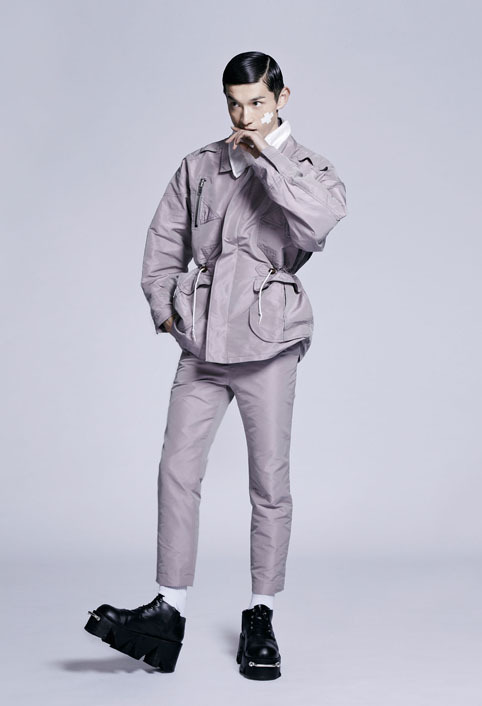 For menswear and accessories designer McGirr, creating an initial line that told his fashion story was paramount to achieve a collection that he was not only proud of, but garments that had a very personal touch. With two collections under his belt in a year’s time he’s already garnered a notable résumé having worked with acclaimed fashion editor, Shun Watanabe (Vogue Hommes Japan), and no stranger to the fashion scene, designer, Charlie Le Mindu. Currently based in London, the Dublin native designs garments with a curve of freshness for the young man who is consciously upstanding in the midst of fashion’s commercial high of … sameness. Who is this slender aficionado wearing his garments? “He’s someone who’s very sick of street wear,” said McGirr. In McGirr’s line inspired by Battle Royale, the influence of school uniforms was the setting for his style narration of what was later to come. It’s quite like a first chapter offering for the progressive lad, who in time evolves as a contemporary gent, all without too many quivers of direct mainstream persuasions. Pieces from McGirr's first garment assembly also had influence from his own style, music, and growing up as a teenager. “It was almost like an overview of my garment experience until that (teenage) point. 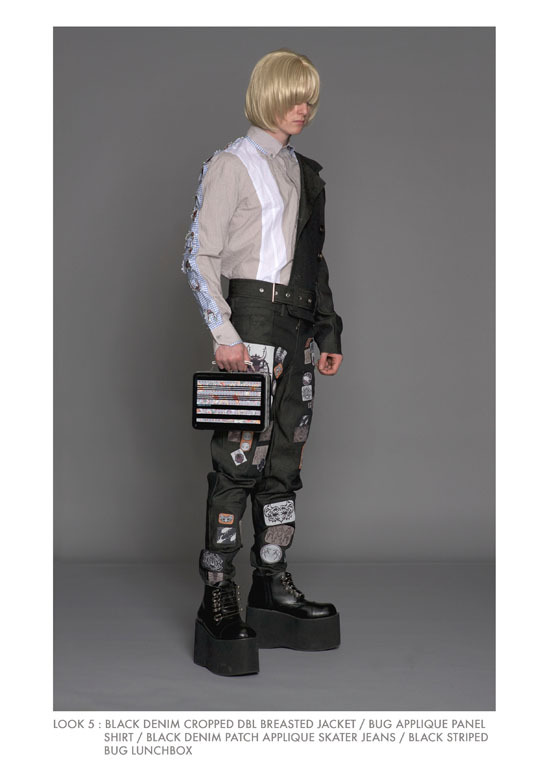 The first collection definitely felt like it had to be made, because there was just a really strong sense of adolescence,” said McGirr. In his current collection, Stand and Deliver you’ll find a much more mature and tailored look, including double breasted jackets, and pieces with a more refined and modern sensibility than his first collection. “I was kind of inspired by how school uniforms can fit very badly, and I wanted to use the same aesthetics, but make them fit perfect in places, and quite loose and fun (in other places). There’s a lot more details in the fit in this new collection,” said McGirr. Stay tuned, his style book has only begun! You may see more from Sean McGirr headed for London Fashion Week this September. What do you think of McGirr's designs? Images: Courtesy of Sean McGirr. Do you have any favourite designers or artists at the moment? Salvator Dali, especially at the moment I’ve been looking at his work a lot because there’s surrealism, fantasy, and modern thinking. I look to Shun Watanabe … I love his attitude toward clothes! I also love Japanese label, Undercover. Last year, I did a collection for Charlie Le Mindu, we raced against the clock, churned it out and it was shown during Paris Fashion Week. I was really happy with it. Any words of wisdom or advice you would give to an aspiring designer? Know who you are, it takes a while sometimes to learn it: understanding what you’re made of, what’s your signature style, and what you bring to the table. It is great to see this young designer-- especially has he is only just beginning to define his aesthetic! Cool post. I like it how it is different from the regular London streewear. the line looks really different and unique! I wonder if I could get Mr. A to wear platform shoes. Take care and also thank you for leaving me that comment on my new blog, it means a lot. All I can think is how does he walk in those shoes? Love the varying outfits posted!!! Amazing lines qnd cout! A very unique style! Gosh, what a warehouse of talent! Make that raw talent! I love his unhinged, rock-hard style... Fabulous designs. Thanks for introducing us to his work. Gotta admit, I HATE those shoes :D But it's all very visually interesting. beautiful inspirations turn amazing designs. Thank you for reading Maiken. I'm sure the designer appreciated the feedback. -xo enjoy your week. I guess it's refreshing to see something a bit different, but the shoes are not my favorite ones - although I like one of the jackets very much! Yep you can definitely see the Japanese influence in his designs, I think he's quite an interesting designer. Definitely will be keeping an eye out for his name! Hi dear, I can see the depths of creativity in his work, very unique and unlike anything I've ever seen before. Good for editorials but not sure if all could translate to reality wear? OMG, this is some really interesting style. Thanks for sharing, luv! 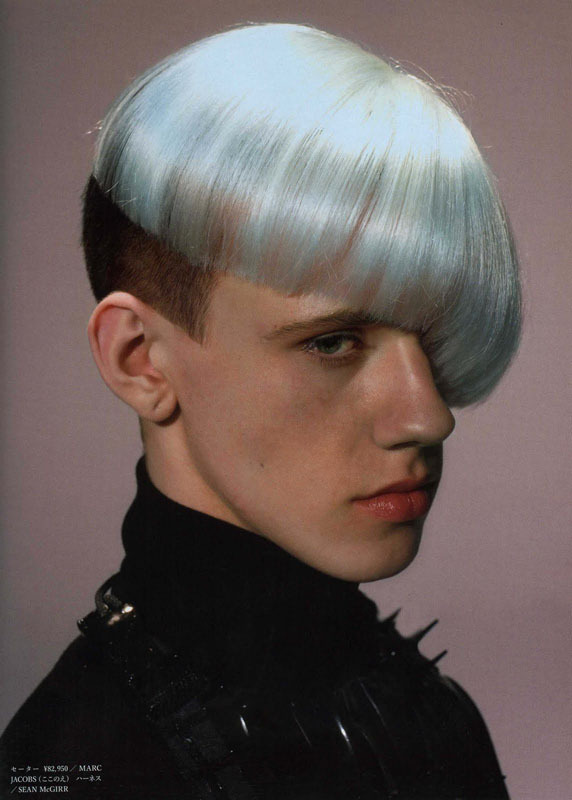 This is definitely a futuristic and it could be an androgynous look...interesting! 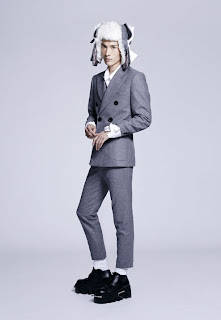 This reminds me a lot of the aesthetic of a Canadian designer, Adrian Wu- very futuristic. I love the mod hair styles- very chic! What a great piece Madison! I love men's fashion and interestingly enough just blogged on it as well. Most times I like men's fashion better than women's because it is edgy and open for interpretation. I love McGirr's designs especially the well-tailored shrunken suit with the platform shoes. He blurs several lines, those between street wear and ready-to-wear; those between genders i.e. the high-heeled platforms and most importantly between serious and fun. Fashion is fun and there must be an element of humour in it. McGirr's shrunken suit proves the point. I hope to see him do androgynous women's designs as well. I would so wear that suit, shoes and all! How awesome that you got to interview him! Love that hat! Very dramatic and different designs! I like the street style designs--it's young and definitely not boring but the designs might be more wearable in the US with different shoes??? Love it! This is a designer who isn't afraid to take chances! Great interview too! Love the hair and his polished punk rock sense of design and style!!! Yes, definitely not afraid of taking risks in design. Thank you. Great point, perhaps in various areas in the States it could be well received. Excellent comment. Thank you for reading, and I'm sure the designer appreciates your feedback as well. I will have to take a look at Wu's work. Thanks so much. lol, Those shoes seem to be the most talked about ... Thanks for your comment dear. how awesome! i'm loving the jackets and shoes. fabulous.